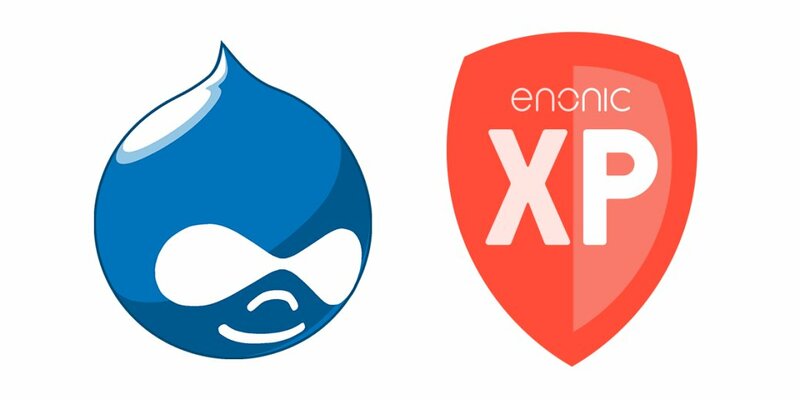 If you’re considering a new CMS and have stumbled upon the platforms Drupal and Enonic XP, you might have wondered what the differences are. In this article we’ll provide a comparison between the two. Drupal is a free and open-source content management framework written in PHP. The standard release—called Drupal core—contains user account registration and maintenance, menu management, RSS feeds, taxonomy, page layout customization, and system administration. What the system lacks in functionality in its core, it can expand upon with a vast library of modules—offering almost any function imaginable. It is also possible to use Drupal for developing web applications, and it is possible to use Drupal as a headless solution, based on a component you must run separately. Drupal is well-known and has a large community of active developers. It is used by several large websites, including Entertainment Weekly, The City of London, the Australian Government, Tesla, and Verizon. It’s free, many people know how to use it, it has fairly good documentation, and it offers more advanced CMS features than e.g. WordPress. While Drupal does have over 42,000 modules to enrich, expand, and enhance its functionality, the modules can create dependencies to themes and to each other. This might pose a challenge when handling scores of modules in the long run, which all need to be carefully updated and verified in order to maintain compatibility with the Drupal core, theme, and other modules. As Drupal is used by more developers and websites than Enonic XP (around 2% of all websites run on Drupal), it has also gathered a larger amount of criticism. Stack Overflow’s Developer Survey 2018 ranks Drupal as the second most dreaded platform in the world, with 70.4% of the respondents giving the platform a thumb down. Seasoned developer Ben Sinclair has made a comprehensive list of Drupal disadvantages, including slow performance, confusing user interface, database storage logic, excessive use of modules to enable functionalities, caching, and many other technical issues. Wikipedia has collected criticism of Drupal too, citing issues with usability, learning curve, backward compatibility, performance, scalability, ineffective search, outdated modules, and more. While Enonic XP has a smaller market share than Drupal, it is used by major Norwegian organizations, like Norway Post, the insurance companies Gjensidige and Storebrand, the national lottery Norsk Tipping, the Norwegian Labour and Welfare Administration, the Norwegian national football league for men, and the UK charity Scope. XP is free and open-source, easy to use, highly stable, and features a fast search function. The disadvantages of Enonic XP include a “too clean” user interface, as Mike Johnston of CMS Critic calls out for more help and support options within the dashboard. Verified user reviews at Gartner.com miss a migration tool for migrating sites to XP. Another disadvantage of Enonic XP contra Drupal is a smaller user base and fewer third-party integrations. It is also worth mentioning that Enonic XP is designed for professional development and continuous delivery from the ground up, and is not meant for non-technical people to set up and maintain (but non-techies can certainly use the CMS part without any trouble). Enonic XP involves less configuration to get started—this is not usually the case for Drupal. Blog publishing in Drupal 8 with keyboard and mouse. Blog publishing in Enonic XP exclusively with keyboard shortcuts. What CMS should you choose? Whether you choose Drupal or Enonic XP depends on what CMS you feel most comfortable with as a web editor, but it also depends on what your developers think is the most feasible, stable, and future-oriented web platform. Drupal has an advantage with a lot of custom modules, but the core might not be the optimal choice for delivering the next generation of digital experiences across devices and channels. As stated on Quora, Enonic XP was designed from scratch in 2015 by a team with over a decade of web content management experience, aimed at being a flexible and smart solution for creating progressive web apps, complex websites, or APIs.